The right VPN service can protect your identity and sensitive data while browsing the web, and give you access to any content you want. See who comes out our top in this comparison between ExpressVPN and SaferVPN! The internet has made our lives significantly easier, but the risks involved have also expanded, leaving us more exposed than before. However, using a VPN can help defend against threats by securing online connections and encrypting your data. Moreover, VPNs give you access to geo-restricted content and streaming services such as Netflix. 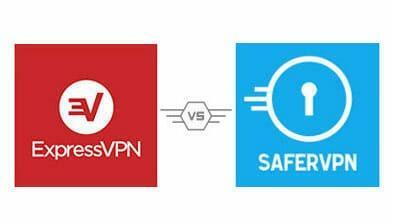 We have tasked our team of experts with conducting a VPN comparison to determine which VPN offers greater value—ExpressVPN or SaferVPN. We’ll put each through a gauntlet and find a clear winner. Read on to discover the winner! Rather than having you run all over the place trying to assess every bit of information, we compare VPN providers to find the top choice. Each provider is tested on a variety of factors that include performance, security features, customer service, and other key components. The best VPNs let users connect to servers around the world simultaneously for better access to geo-restricted content. SaferVPN has over 700 servers in more than 140 countries worldwide, and provides unlimited bandwidth to users. In addition, the brand offers apps for Windows, Mac, iOS, Android, Chrome, Linux, and routers alongside access from 5 devices simultaneously. In the server category, ExpressVPN takes the lead though, with more than 1,500 servers across 94 countries, and unlimited bandwidth. The company is compatible with the systems mentioned above, as well as Mozilla Firefox, Safari, gaming consoles, and many others. Users can log in from 3 devices at a time, which is slightly less than the competition. Available Streaming Services. Access to geo-restricted movies and TV is a key benefit the best VPN services deliver, with both SaferVPN and ExpressVPN users able to readily use BBC iPlayer, and Netflix. Mobile Apps. Connecting online through a mobile device still carries the same risks for users’ identities. To combat this risk, SaferVPN and ExpressVPN support Android and iOS devices such as tablets and smartphones. Protocols. Encryption algorithms give users the ability to customize their level of privacy and speed. SaferVPN utilizes IKEv2, IPsec, and OpenVPN. ExpressVPN works with PPTP and L2TP, which are quite popular choices. Kill Switch. If your secure connection becomes unsecured, kill switches will safely disconnect you to prevent any exposure. In this category, both ExpressVPN and SaferVPN each offer this important tool across all their plans. Money Back Guarantee. Having a refund policy lets users compare VPN services with little risk. To ensure users are satisfied, SaferVPN and ExpressVPN provide refunds within 30 days if subscribers change their minds. Speed. VPN providers can sometimes affect network speed, though the best ones minimize this impact. ExpressVPN is widely considered one of the fastest available VPNs, with little effect on both connections and downloads. In terms of speed, SaferVPN is comparatively considered the middle of the pack. Above all, a VPN’s main function is to provide a secure and private connection. SaferVPN works with three different algorithms to ensure the encryption of its clients’ data is up to par, and offers a kill switch option which is a must-have function. This brand does, on the other hand, log the users’ transactions online, but claims it is in the consumers’ best interest. ExpressVPN employs two algorithms for encryption purposes, and also provides a kill switch function. However, one area that sets them apart is that the company pledges it will not copy, store, or utilize the data you produce while enjoying the service. SaferVPN’s team is available by email or a live chat all day, every day of the week, and is staffed by efficient and helpful team members. ExpressVPN’s representatives can be reached via an inquiry form, live chat, or email, and they also man the help desk at all times. Overall, both these competitors were ranked highly for their focus on handling support functions seriously. Lastly, we conducted a VPNs price comparison, see which brand offers the better deals. SaferVPN offers 4 payment plans: $9.99 for a monthly plan, 1 year for $4.49 a month, or a 2-year subscription for $2.49. Each of the company’s plans includes a 30-day refund policy. ExpressVPN has 3 subscription plans: 1 month for $12.95, 6 months for $9.99 a month, or $8.32 a month if you choose to commit to a full year. They also offer the standard 30-day money-back guarantee to accompany each package. Our experts warmly recommend both of our competitors today, but we still must choose a winner. ExpressVPN managed to dazzle us with its features and customer service. The slightly higher price tag is worth every penny, with the company separating itself thanks to strong performance and excellent server options. SaferVPN is still a solid option if you’re looking for a more affordable solution, and if you want to connect more devices simultaneously. We would like you to choose our next VPNs comparison contenders, so write the services of your choice in the comments section below for our upcoming reviews. You’d think that with the name of SaferVPN that they wouldn’t log anything, but they do. Personally, I’ve been using ExpressVPN for about two years now. It is a solid service with good speeds and a large network. I need to spoof my location a lot for accessing gambling sites and it is great for doing that. Oh, I watch BBC iPlayer with it too. Gotta get my Doctor Who fix ya know. Hi there. I’ve been using ExpressVPN for a while, but it’s got to the point that I want more customisation options with the configuration. I’m trying to find a provider that offers numerous protocols and still retains the same speed and reliability of Express. Can you recommend any? Hi, and thanks for the question! There are several different VPN providers you can try if you’re looking for customization options. We recommend you start by exploring our top providers here. Services like NordVPN and SaferVPN offer great customization options, as well as PrivateVPN, though their speeds may vary depending on which protocols you decide to use. Let us know which you choose, and how it works for you! ExpressVPN seems to be worth it for the speed, but man that price difference makes the choice tougher! Do you think the 1,500+ servers you saying is worth it? Are servers on SaferVPN more better than xpress? What do you think? Hi! Having more servers to connect to is always a better bet than having less of them. The reason is simple: if you have more options, even if one isn’t working you’re still likely to find a server that lets you connect to the services or web properties you want. In terms of individual servers, we found both companies offer great connectivity and good speeds, though we have to give a slight edge to ExpressVPN. We hope this answers your question!